I’ve been getting into drawing sketch cards using Copic and Pigma Micron markers. These cards have been posted on my Facebook Fan Page and Twitpic accounts. Now I will start to post them here. I have about a dozen previously drawn cards to post here and new ones will be posted as well. When I first started reading comics, Crisis on Infinite Earths was going down. I had gotten some random issues of that series from a friend in High School. So my first real exposure to Supergirl in the comics was the Death of Supegirl in Crisi on Infinite Earths #7. I kind of got a little confused as they brought her bcak in different ways. But I really liked Peter David’s take on her through the late 1990’s-early 2000’s. And the newest Supergirl series has some great stuff going on as well. 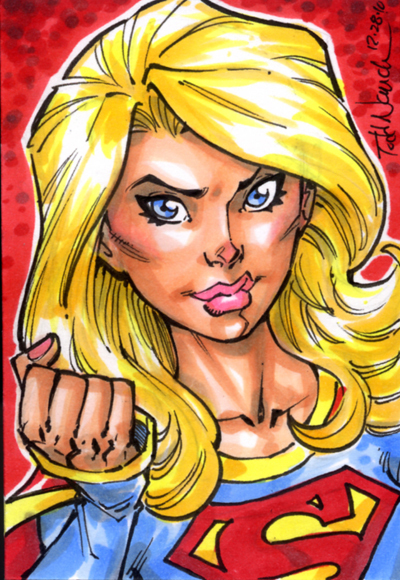 This entry was posted in Sketch Cards and tagged comics, copic, dc, pigma micron, sketch card, supergirl, superhero by Todd Nauck. Bookmark the permalink.